The short answer is, the average distance to the Moon is 384,403 km (238,857 miles). But before you go thinking that this is the final answer, you need to consider a few things. For starters, note the use of the word “average”. This refers to the fact that the Moon orbits around the Earth in an elliptical pattern, which means that at certain times, it will be father away; while at others, it will be closer. Hence, the number 384,403 km, is an average distance that astronomers call the semi-major axis. At its closest point (known as perigee) the Moon is only 363,104 km (225,622 miles) away. And at its most distant point (called apogee) the Moon gets to a distance of 406,696 km (252,088 miles). This means that distance from the Earth to the Moon can vary by 43,592 km. That’s a pretty big difference, and it can make the Moon appear dramatically different in size depending on where it is in its orbit. For instance, the size of the Moon can vary by more than 15% from when it’s at its closest to when it’s at the most distant point. It can also have a dramatic effect on how bright the moon appears when it is in its Full phase. As one might expect, the brightest full Moons occur when the Moon is at the closest, which are typically 30% brighter than when it’s fathest away. When it’s a Full Moon, and it’s a close Moon, it’s known as a Supermoon; which is also known by it technical name – perigee-syzygy. To get an idea of what this all looks like, check out the animation above that was released by the Goddard Space Flight Center Scientific Visualization Studio in 2011. The animation shows the geocentric phase, libration, position angle of the axis, and apparent diameter of the Moon throughout the year, at hourly intervals. 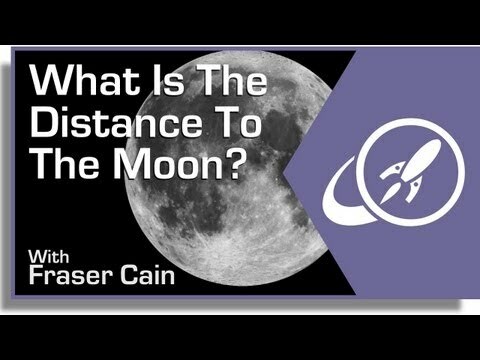 At this point, a good question to ask would be: how do we know how far away the Moon is? Well, that depends on when we’re talking. In the days of ancient Greece, astronomers relied on simple geometry, the diameter of the Earth – which they had already calculated to be the equivalent of 12,875 km (or 8000 miles) – and the measurements of shadows to make the first (relatively) accurate estimates. Having observed and recorded how shadows work over a long period of history, the ancient Greeks had determined that when an object is placed in front of the Sun, the length of a shadow this generates will always be 108 times the diameter of the object itself. So a ball measuring 2.5 cm (1 inch) across and placed on a stick between the Sun and the ground will create a triangular shadow that extends for 270 cm (108 inches). This reasoning was then applied to the phenomena of Lunar and Solar Eclipses. In the former, they found that the Moon was imperfectly blocked by the shadow of the Earth, and that the shadow was roughly 2.5 times the width of the Moon. In the latter, they noted that the Moon was of sufficient size and distance to block out the Sun. What’s more, the shadow it would create terminated at Earth, and would end in the same angle that the shadow of the Earth does – making them different-sized versions of the same triangle. Using the calculations on the diameter of the Earth, the Greeks reasoned that the larger triangle would measure one Earth diameter at its base (12,875 km/8000 miles) and be 1,390,000 km (864,000 miles) long. The other triangle would be the equivalent of 2.5 Moon diameters wide and, since the triangles are proportionate, 2.5 Moon orbits tall. Adding the two triangles together would yield the equivalent of 3.5 Moon orbits, which would create the largest triangle and gave the (again, relatively) accurate measurement of the distance between the Earth and the Moon. In other words, the distance is 1.39 million km (864,000 miles) divided by 3.5, which works out to around 397,500 km (247,000 miles). Not exactly bang on, but not bad for ancient peoples! Today, millimeter-precision measurements of the lunar distance are made by measuring the time it takes for light to travel between LIDAR stations here on the Earth and retroreflectors placed on the Moon. This process is known as the Lunar Laser Ranging experiment, a process that was made possible thanks to the efforts of the Apollo missions. When astronauts visited the Moon more than forty years ago, they left a series of retroreflecting mirrors on the lunar surface. When scientists here on Earth shoot a laser at the Moon, the light from the laser is reflected right back at them from one of these devices. For every 100 quadrillion photons shot at the Moon, only a handful come back, but that’s enough to get an accurate appraisal. Since light is moving at almost 300,000 kilometers (186,411 miles) per second, it takes a little more than a second to make the journey. And then it takes another second or so to return. By calculating the exact amount of time it takes for light to make the journey, astronomers are able to know exactly how far the Moon is at any time, down to millimeter accuracy. From this technique, astronomers have also discovered that the Moon is slowly drifting away from us, at a glacial rate of 3.8 cm (1.5 inches) a year. Millions of years in the future, the Moon will appear smaller in the sky than it does today. And within a billion years or so, the Moon will be visually smaller than the Sun and we will no longer experience total solar eclipses. We’ve written many articles about the Moon for Universe Today. Here’s an article about how LCROSS discovered buckets of water on the Moon, and here’s an article about how long it takes to get to the Moon. We have recorded several episodes of Astronomy Cast about the Moon. Here’s a good one, Episode 113: The Moon, Part 1. > the Moon takes an elliptical path around the Earth. The planets make nearly elliptical orbits around the Sun, close enough for reasonable approximations, but the Moon’s Orbit around the Earth is sufficiently influenced by the Sun that it follows a path detectably different from an ellipse. How would you describe the path? A “roughly” elliptical path? Sure that would work. Perhaps calling it a beautiful 3d spirograph of an orbit would also work. What dictates a moon or planet to have a either a perfect circular orbit or a elliptical orbit.? A question with a question? Damn your good!